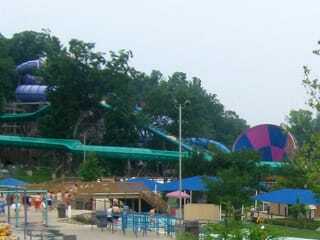 Holiday World was much busier today than it had been during my visit in June. However, it only took two minutes at the ticket office to realise that nothing else had changed. I had to buy admission for four people without any discount coupons whatsoever, and the teller handed me a few that had been left there by a previous guest. It seems very unlikely that I'd see that kind of helpful behaviour anywhere else. We started our morning on the Raven. It was impossible to tell any difference from earlier in the year, which in many ways is a mark of a good coaster; the mad dash through the woods was as fun as ever, and the amazing mid course drop still took my breath away. The wait at this stage had built to nearly an hour, precluding us from riding again, but the operator told us we might like to come back at lunch time. We did just that, to find the queue had vanished completely. This allowed us to clock up eight consecutive rides, several without leaving the train! Legend had a staff shortage today, which meant that only one train was in use. Amazingly, staff were actually warning people about this and telling them why, another nice touch. Apparently the ride is good for about a thousand people an hour with both trains, which naturally drops to half that for only one. We made a quick stop at Howler so that James and Andrew could get the credit, before moving to the water park. Unfortunately, it seemed that just about everyone else in the place had done the same thing. As a result one could barely move in the Lazy River, and the Wave Pool was absolutely jam packed. The knock on effect of this was short tempers all round, made all the worse by an hour long queue for Zinga. Twenty minutes of this was the wait for one of the rafts, and the rest was the time taken to get to the top. Though it is still my favourite water slide, nothing in a water park is worth waiting that long for. In the end the only other attraction we had time for was the Zoombabwe water slide. Bad weather cleared the queue for us making it possible to ride twice with minimal waiting.